Many of us use our phones to jot down recipes. Many home cooks probably relate to Pedantic Foodie, whose iPhone Notes app has become cluttered with fragments of recipes that haven’t come to life quite yet. 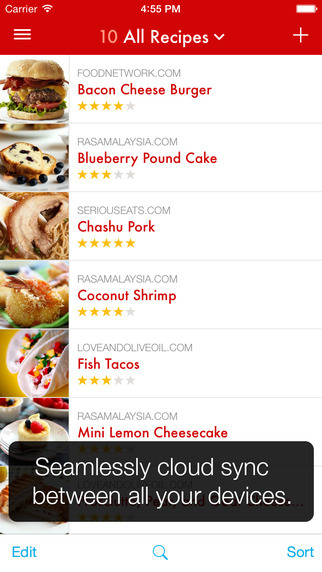 Those who are looking for a way to organize their recipes, however, can rely on another app: Paprika. Paprika has a host of different features that make it perfect for anyone experimenting in the kitchen. It’s able to import recipes from some of the most popular recipe sources on the internet, and even some more obscure ones with the help of an intelligent copy-and-paste tool. You can use the app on just about any device, and it syncs automatically so all of your saved recipes can be accessed anytime, anywhere. The app even stores information locally on your device – great news, because not using WiFi or a data connection is a great way to save on mobile battery, and when it comes to cooking large meals, you’ll want your phone or tablet to last for as long as it can. Saving and creating recipes on the app is easy, but using the app to cook is even easier. There are several features such as the ability to cross off ingredients, highlight steps, and switch between recipes with the swipe of a finger that all give the app the functionality one would expect from an app that promises to be “most useful app you’ve ever downloaded” and “the perfect kitchen companion”. You can even use the app to plan meals throughout the week! For this recipe, I used Stubb’s Bar-B-Q Rub which contains a mix of smoked salt, paprika and black pepper. It pairs perfectly with the crisp, smoky bacon in the dish.